BioTek's MultiFlo™ Microplate Dispenser offers a single peristaltic pump for dispensing into 6- to 1536-well microplates. 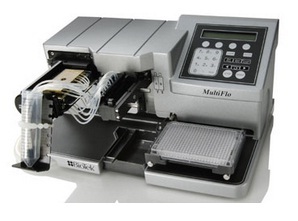 The MultiFlo dispenses a broad volume range from 500 nL to 3 mL accurately and precisely in a compact design. BioTek's proprietary angled dispensing ensures compatibility with all dispense protocols including reagent addition to loosely adherent cell monolayers. For assays requiring minimum reagent usage, the MultiFlo's prime volume is under 1 mL. A built-in priming trough is designed to allow both recovery of reagents or to send primed reagent directly to waste.